Built in 1917 as SS J.C. Donnell by Newport News Ship Building & Dry Dock Co., Newport News, VA. for the Atlantic Refining Co., Philadelphia, PA. Struck from the Naval Vessel Register 11 October 1943. 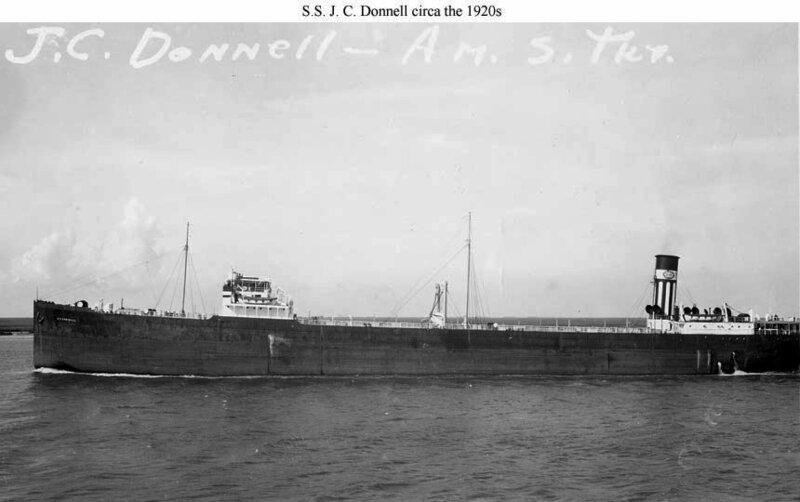 50k Photo of SS J. C. Donnell from the data card maintained for the ship by the Navy during World War I, may show the tanker fitting out at Newport News circa January 1918. At that time the Navy assigned her the identification number ID-2250. 52k SS J. C. Donnell in service with the Atlantic Refining Co. circa the 1920s. This firm used unusually elaborate funnel markings during this period. The oval contains the company's name and, in the middle, the word "oils."